Perennial Trumpet Flowers (Incarvillea) are from central Asia, with most of the species growing in the Himalayas or Tibet. 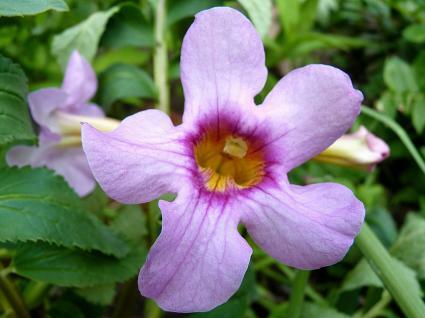 There are sixteen species in the genus, but the most common of them is Delavay's Trumpet Flower (Incarvillea delavayi), also known as hardy gloxinia or Chinese trumpet flower. It is from southwestern China and is named after an 18th century Jesuit missionary. Hardy gloxinia has large bright pink trumpet flowers with yellow throats that tower over deeply cut green leaves. The leaves grow at the base of the plant while the flowers grow on tall stalks. Hardy gloxinia is an ornamental perennial hardy to zones 5 to 7. Some information says it is hardy to zone 9, but the plant is intolerant of the heat of Southern summers. It is used to brighten flower beds with its flowers, which bloom from late spring to late summer. It can also be used as a border. In cooler zones, it can be grown as an annual. This plant has a large taproot that must be in well-drained soil. It is best grown in a rock garden or raised bed. It will also grow in containers. Hardy gloxinia needs full sun to grow well. However, in the South, afternoon shade will help it tolerate the extreme heat of summer. Till the earth in the flower bed to a depth of six inches. Work in three inches of compost to the bed. This will ensure the good drainage this plant requires. Hardy gloxinia will grow to a height of 18 to 23 inches and a spread of 12 to 18 inches, so they should be planted 24 inches apart. Plant crowns to the depth of three to six inches in the fall. Water in well. Plants are relatively late emerging in the spring so mark where they are planted. Plants may also be grown from seed. Sow in autumn where you want the plants to grow. The seed needs light to germinate, so do not cover the seeds with soil. Hardy gloxinia needs constant moisture when flowering but should never be saturated with water. The taproot requires good drainage or it will drown. Flowers should be deadheaded to encourage further flowering. Crowns should be mulched in the winter to protect them from the cold. Slugs are a frequent problem with this plant. A dwarf, this hardy and drought-tolerant plant often succeeds where other kinds perish. This is a shy bloomer. It bears clusters of deep pink flowers on short stalks that hardly rise above the leaves.These flowers are funnel-shaped and about two-and-a-half-inches long. This is another dwarf trumpet flower with shorter leaves and more rounded leaflets than I. delavayi. It has a less tuberous root that grows a smaller rosette of leaves are approximately a foot long. In young plants, these shiny green leaves lay flat, while they arch in older plants. Mature plants can have flowers that are nearly four inches across and two to three inches deep. The flowers are divided into four lobes of soft rose-carmine with a yellow tube. The throat of the flower has white blotches on it. This native of Turkestan is more of a shrub than some of the trumpet flowers. The leaves are on stems of four or five feet. They are cut deeply and are opposite one another on the stem. The flowers are tubular and are pale pink. They are about an inch long and an inch wide and appear on the plant in loose clusters of several flowers on short stalks. This perennial has flowers about an inch long and a of a beautiful light rose color. The flowers are on stems about two feet long while the short, finely-cut foliage of vivid green is close to the ground. This trumpet flower blooms later than some, during the late summer and early autumn. Hardy gloxinia are perennials that may be grown as an annual in areas where it is too cold to overwinter successfully. The beautiful foliage and striking flowers of this delicate plant make it worth the effort to grow.